Aksuat - A Kazakh Film By Serik Aprimov is an event that took place on 13-May-2007 in Hyderabad. For several people in post-USSR Kazakh, staying in their villages vs. leaving is the Devil's Alternative. So when Aman says, "This is my house, my matches," he can't but get his director awards. The Hyderabad Film Club, in collaboration with the Federation Of Film Societies Of India, Mumbai, is organising a 3-day Festival Of Films From Central Asia, from 11th to 13th May, at Sarathi Studios in Ameerpet. Today, the final day, Aksuat, a Kazakhstan movie, will be the first film to be screened. The movie is directed by Serik Aprimov. Aksuat is the name of the village where the director of the film was born and lived. The modern accessories of life, such as mobile phones, cars and satellite dishes, notwithstanding, the lifestyle here remains essentially traditional, with the decision of the elder - a local mob leader - controlling any action that is taken in the community. The story evolves around the relationship of two brothers: Kanat and Aman. Kanat is a quintessential "new Kazakh" - flat broke and disenchanted - who comes back to the village with his pregnant Russian wife. The elder brother Aman has lived in the village all his life, built a house and settled down, but never married. 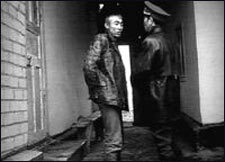 Aksuat marks the breaking point in the development of Kazakh cinema in the era following the collapse of the USSR and the attainment of independence. The fates of the two brothers are the metaphors of the possible nation-building. The ones who leave lose their roots and moral values embedded in the traditional background. Those who stay in the countryside live a hard life in a corrupt, unjust society. But for all the hardships, the protagonists remain in their mothers' land. Thus, Aman's is the punch line of the film: "This is my house, my matches." Serik Aprimov won the Audience Award at the Nantes Three Continents Festival in 1999. For further details, please contact Bh S S Prakash Reddy of the Hyderabad Film Club at 2373-0841/93910-20243. Be the first to comment on Aksuat - A Kazakh Film By Serik Aprimov! Just use the simple form below. fullhyd.com has 700,000+ monthly visits. Tell Hyderabad what you feel about Aksuat - A Kazakh Film By Serik Aprimov!